Winter is on the way and, if it's anything like last year, it will be cold, wet and seem to last forever. But, that's no excuse to stay inside! As long as you have the right kit, winter can be a wonderful time to enjoy the outdoors. At Outdoorgear we love the self-heating disposable handwarmers which heat up instantly, for cosy mitts whatever the weather is up to. Perfect for a round of golf, commuters seeking comfort as they wait for the early bus, as well as hard-core hikers who need immediate heat in order to make it to the summit (and back) - we've tested two handwarmers to see which is the best to keep you warm this winter. Manbi Handwarmers. Available as a pack of 2, or boxes of 48 pairs. 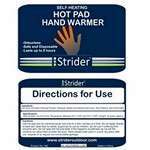 Strider Hot Pad Handwarmers. Available as a pack of 2, or boxes of 20 pairs. We found that, on average, the Strider Handwarmer lasted longer than the Manbi alternative. Strider stayed active for a huge 7hrs 48mins, with Manbi behind at 6hrs 6mins. The Strider also functioned at a higher temperature for longer, noted down as 'hot' for an average of 5.2 hourly readings (Manbi, 3.6). However, our lovely handwarmer guinea pigs also found that the type of jacket used made a big difference to the longevity of the product. It makes sense, but the handwarmers popped in the pocket of a highly insulated jacket, irrespective of brand, lasted hours longer than those left with no insulation at all. Strider Handwarmers came out top, but are not necessarily the best value product for the job - it depends on what you're up to. A key element to consider is cost, and Manbi Handwarmers are cheaper than Strider while still performing very well. If you're off for a dog walk or taking the kids to watch fireworks, you won't be outdoors for hours and hours, so we recommend Manbi which is a great product - especially when compared to some cheap alternatives. You'll save money and stay warm for as long as your activity lasts. Also, if you're planning on using handwarmers often (the train stations are chilly at this time of year) then remember that the Manbi Handwarmers are available in boxes of 48 pairs, saving you even more money. However, if you want the hottest, longest lasting product, then Strider is the best in test. If you're planning a mountain expedition and packing a handwarmer in your rucksack for emergencies - we'd recommend taking Strider. It is slightly bulkier (hence its long life) and costs a little bit more, but if you're huddled in an emergency shelter, you want the hand warmer that will keep you warmest for longest. 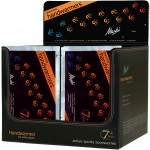 All our staff agreed that both these handwarmers are really great products, so pack your kit according to your activity. There's no excuse - pop a handwarmer in your pocket, get outside and enjoy whatever this winter has in store!